Dar es Salaam is positioning itself as a regional hub, upgrading its port to attract more business from its neighbouring landlocked countries. The EAC railways master plan incorporates the standard gauge railway’s Northern and Central Corridors, which are both commercially viable for landlocked countries in the region as they give them strategic access to the ports of Mombasa and Dar es Salaam. The Northern Corridor Integration Projects championed by Rwanda, Kenya and Uganda spearheaded the establishment of a railway link from Mombasa to Kigali. In June 2013, a Northern Corridor Integration Projects Heads of State Summit held in Kampala put in place mechanisms for fast-tracking the development of the SGR. Tanzania has secured a $7.6 billion loan from China’s Export-Import Bank (Exim) for the construction of a railway line that will link it with Burundi, Rwanda and Democratic Republic of Congo. President John Magufuli secured the concessional loan after meeting with the Exim Bank’s president Liu Liang. President Magufuli, while announcing the funding, alluded to a preferential deal without providing details. Oil and gas discoveries have turned Tanzania into an exploration hotspot, but the country’s transport infrastructure has suffered from decades of under investment. The country is also positioning itself as a regional hub, upgrading its port to attract more business from its regional landlocked neighbours. According to Mr Liu, China Exim Bank will offer Tanzania technical support. Last year, Tanzania announced that it had awarded rail contracts to a consortium of Chinese firms led by China Railway Materials (CRM), which included the standard gauge rail project. The Exim Bank is also financing a $1.2 billion, 532km natural gas pipeline in Tanzania. On Wednesday last week, Finance and Planning Minister Dr Philip Mpango after a meeting with Dr Alberic Kacou, African Development Bank vice-president for human resources and corporate services, announced that Tanzania had secured a further $200 million loan from the AfDB to finance transport infrastructure projects. “We will use some of this funds towards the construction of the SGR project to transform the country’s infrastructure,” Dr Mpango said. In an interview with Bloomberg, Gerson Msigwa, a spokesman for Tanzania’s presidency, said the construction will start by July next year. Before then, Tanzania and Exim Bank China will be expected to have finalise technical issues on the contract and sign the financing deal for the 2,190km project. 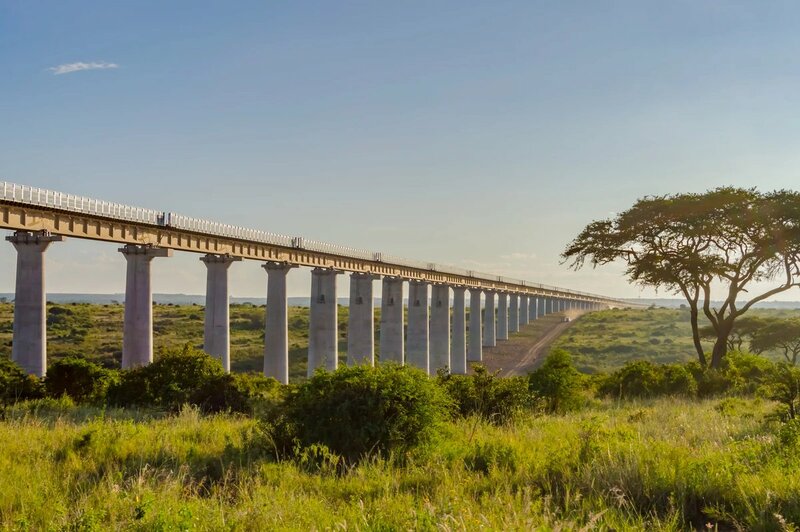 Tanzania Transport Minister Samuel Sitta said the SGR will have a main line that will connect the port city of Dar es Salaam to Rwanda and Burundi, with additional branch lines running within the country. “We expect to have two offshoots: One of them to Mwanza, which will open up the lakeside port city and link it with Uganda, while the second one will link to the coal, iron ore and soda ash mining areas in the south. Through this, we expect an increase in cargo on this route,” Mr Sitta said, adding that will be at an additional cost of $6.6 billion. Already, Tanzania has signed contracts with China Railway No 2 Engineering Group to build a rail link between the southern port of Mtwara, which is rich in coal, iron ore and natural gas. The contract will see China Railway No 2 Engineering Group provide 10 per cent of the funding with the rest provided by the government. Kenya is also constructing a $3.27 billion 609km new standard gauge railway line between Mombasa and Nairobi to boost the movement of cargo from the port. However, queries have been raised over the economic viability of SGR, after key landlocked states indicated their intention to connect to the Indian Ocean through Tanzania. The issue of cost is also bound to arise now that Tanzania’s SGR is four times longer than Kenya’s but only two times as expensive. In a previous interview with The EastAfrican, Kenya Railways managing director Atanas Maina said that the cost of the Kenyan SGR was high because of the design adopted, which will see the train maintain an average speed of 80 kilometres irrespective of the terrain. “We have built bridges, and raised the track in areas where we would have had corners to achieve the average speed we expect the wagons to travel at. This has increased the costs immensely as compared with the neighbouring Ethiopia and Tanzania SGER designs that haven’t taken this into account,” Mr Maina said. Recently, a confidential World Bank report cast doubt on the region’s push for the SGR projects, saying they would only be viable with increases in cargo of between 20 tonnes and 55 million tonnes per year. The report done by the Africa transport unit at the World Bank titled The Economics of Rail Gauge in the East Africa Community showed that the volumes of the forecasts undertaken for the EAC railway master plan and central line in Tanzania, are unattainable over the medium to longer term. “Based on these assumptions, there is no economic or financial case for standard gauge in the EAC area at this time. A refurbished meter gauge network would appear to be the most appropriate option in economic and financial terms, and could easily accommodate forecast traffic up to 2030, with lower investment requirements,” the report concludes. The World Bank team highlighted the rehabilitation of the existing railway network as the best alternative, which would allow a phased approach to the regions development, consistent with current and projected demand and the financing envelope available. The SGR alternative, which the regional governments chose, involves the construction of a standard gauge railway on a new right of way, an option the World Bank team said required additional investment in land acquisition and structures, and new right-of-way construction. “This alternative predicates axle loads in the order of 25 tons per axles and a maximum operating speed of up to 120 km per hour. Again, based on these assumptions, the estimated maximum carrying capacity of the current network would exceed 60 million tonnes per year. The estimated investment cost per km will be $ 3.25 million,” the report said. From the estimates provided, the Tanzanian new railway line will cost an average of $3.4 million per kilometre. It is time now to look at the cost of the two rails as we know cost of construction is very important for prospect of any infrastructure! i welcome bright minds to contribute and not some propaganda in here! Okay i am new to this forum but i notice that there is a lot of misconception around the kenyan sgr. First in terms of cost we might say kenya got a very good deal. The kenyan sgr is class 1 chinese standard capable of a minimum axle load of 25 tonnes and able to handle double stack trains. None of our neighbours have this the TZ sgr is arema standard which can't handle double stack wagons but you can go at higher speed. A typical cargo train on the kenyan sgr will measure 880 metres long, with 54 double stack wagons this means while our neighbours can go faster by like 40 km/hr, ours will transport more cargo per trip albeit some few minutes late. Combined with the economic boost this rail has had on tourism, manufacturing, easing movement of people and goods, it caused a jump in economic output by 1.5% i.e out of the 6.1% growth in 2018 1.5% can directly be attributed to the sgr even if it is yet to make a profit. Go and Check out, TRC have ordered Double Stark wagon. How can they Order while they can't use it. TRC can't have Double stark. Najua mkifika huko makutopora kama 2027 mtakua hamcheleweshi kutuonyesha mapicha ya hayo madaraja katika kila comment Kama vile mlivyofanya mlipopata ‘drimulaina’ ya kwanza. Lakini kwa sasa wacha tuburudike na haya ya huku kwetu. KENYA'S STANDARD GAUGE RAILWAY is the cheapest in East Africa, we can report. It cost US$4.43 million per kilometer while Ethiopia spent $5 million, Eritrea $ 5.05 and Tanzania's central Corridor will cost $4.05 million for the same length. This is despite the fact they are upgrades on existing lines and are of inferior quality to Northern Corridor SGR. The Central Corridor line is AREMA standard while the Ethiopian Djibouti line is Class two Chinese standard. The Northern Corridor, on the other hand, is Class one Chinese standard designed for double stack wagons while the other two are single stack lines. The Maximum load capacity of both the Central Corridor and the Ethiopian line is 20 tones while the Northern Corridor's capacity is 35 tonnes. In addition, the Central Corridor and the Ethiopian lines have level Crossings with no bridges, The Kenyan line on the other hand boast of 29.5 Km of bridges and no level crossings. Experts say that bridges take 30 percent of rail or road construction cost because of embankments. We will ignore the nagging question whether Tanzania can generate enough power to run a train. Already, the 300 Km Dar- Morogoro section, whose construction the President launched last week, will cost a whopping $1.215 billion according to Tanzania’s Daily News. That works out to $4.05 million per Kilometer and that excludes land compensation and electrification. These new figures put paid to the allegation the Kenyan, SGR, though a green field project, is the most expensive in East Africa. The numbers also answer the critical” question: Just what is the difference between the Northern Corridor Standard Gauge Railway and the other two in East Africa? If the numbers here are anything to go by, the myth that the Northern Corridor SGR is expensive is debunked. Kenya’s greenfield SGR is the cheapest in the region at $4.43 million per Kilometer. The debate about the three SGR lines centers on cost leaving out other factors at play in the costing of any SGR line. The Northern Corridor SGR say, critics, is the most expensive in East Africa and therefore some fellows in power must have pocketed a large chunk of the money through rent-seeking, they conclude. The third and critical difference is: The northern Corridor SGR is green field while the other two are upgrades of old railway lines. The 752.7km Ethiopia-Djibouti railway is an upgrade of the meter-gauge line to a 1,435mm gauge line, and electrification at 25kV. It seems that the cost of upgrading a kilometer including installing electric lines is a standard US$ 5 million. Here, the contractor has to ensure that a lot of engineering facets such Viaducts, tunnels and embankments are minimized or eliminated. Where they cannot be avoided, they should be as short as possible. Cutting costs is the leading determinant. The Cost per Kilometre for a greenfield project does not appear standardized given the peculiar circumstances of each region and country. Further such engineering instruments as viaducts, Embankments, and tunnels are not avoided or minimized. Here the smooth run of the train is a major determinant. These findings debunk the myth by some analysts of questionable integrity that the “Lunatic Express” which runs from Mombasa to Kampala, could be upgraded at US$200 million. The known expenditure on these three lines thus explodes the myth that Northern Corridor is expensive. In fact, the northern corridor, even as a greenfield project is more than $50,000 cheaper per Kilometre than the upgraded ones. This, analysts say, is likely to be extended to Mwanza which will mean that the upgrade will involve 1,219 KM. Tanzania will build just about 320 kilometres of greenfield Standard Gauge Railway between Isaka and Keza on the border with Rwanda. Kenya’s SGR between Nairobi and Mombasa cost $2.66 billion or $4.43 million a kilometre. If the cost of the $1.44 billion contract for the supply of Locomotives and rolling stock namely; 56 Locomotives, 40 passenger coaches, 1620 wagons, the Mombasa –Nairobi section, which is 600 kilometres of railway plus the locomotives and rolling stock cost $4.1 billion. On the second score that of carrying capacity, the class two Chinese standard line is beaten hands down. The wagons axle load capacity is 25 tons maximum while the Northern Corridor SGR has 25 tons as the minimum axle load capacity. Therefore the Northern Corridor line can carry more freight than the upgrade one-meter gauge lines. Consequently, wagons are double stack wagons that can carry two containers stacked one on top of the other. The wagons on the northern corridor will carry more freight per trip than the other two. In fact, 56 double stack wagons will haul 4,000 tons, what 130 trucks carry. On the other hand, the Ethiopian line’s only publicly recorded haulage is nearly 1, 200 tons of relief food in 2015. That is nearly a quarter of what will be hauled on the northern corridor in a single run. Yet, on this simplistic analysis that the Tanzanian President, John Magufuli, according to Uganda’s Daily Monitor Newspaper, attempted to woe Uganda’s Yoweri Museveni, to discard the Northern Corridor in favour of the Central Corridor. This sounds like a pipe dream. Here’s why; Tanzania is inviting Uganda to abandon its SGR ambitions and all its potential benefits to rely on Tanzania instead! That is like transferring one’s inheritance to a neighbour’s children. Uganda is being asked to retain its archaic 19th century railway line so that Tanzania’s SGR can remain profitable! According to the Investor Briefing referred to earlier, Tanzania can only generate 3.1 million tons of freight for a line designed to carry 1aA7 million tons a year. If Uganda falls for the trick, it will have to abandon its 1617 Km network which is projected to save the country US$2 billion a year in freight costs and also abandon the Uganda- South Sudan Line thus hurting its business interests in South Sudan. The entire 1617Km of the Uganda section of the SGR will cost an estimated $12.8 billion, says Uganda’s Daily Monitor while the Kenyan side will cost an estimated $11.4 billion, it says. A Railway line opens up opportunities in a country; creating new business opportunities for people neighbouring the line, easing the cost of transport and improving on the transit time. In effect, a railway line has direct links with the local economy. Consequently, Uganda will be transferring her potential benefits to Tanzania if she abandons her SGR as she will have to ship her imports and exports through Tanzanian Ports. A large Ferry can carry only 45 containers, meaning to off-load a 218 container train will require Five ferries. Marine transport across Lake Victoria collapsed more than a decade ago, says the Monitor in another report. It will thus need massive investment in infrastructure, Marine Vessels and other equipment to meet demands of a modern high-speed railway. Short of this, Marine transport across Lake Victoria will become a bottleneck to Uganda’s international trade. The journey across the Lake could take more than 8 hours of travel assuming the seamless transfer of the freight. This compares negatively to the two hours by high-speed train from Malaba to Kampala. This section is 273 Kilometres long and, according to reports, will cost $2.3 billion. This works out to an average cost of US$8.5 billion which includes the cost of locomotives and rolling stock at US$180 million. One wonders how many locos, freight wagons and passenger coaches this money can buy. The East African report quotes Uganda Officials as saying that the Malaba- Kampala section will be 339KM of rail and that its costs include the cost of building a polytechnic in Tororo, eastern Uganda for $30 million, staff facilities for $25 million and spend $20 million to improve the Kampala railway station. Wewe jamaa hizi article umezitoa wapi!! Mbona zimejaa uwongo wa kijinga!! kabla huja kurupuka ebu fuatilia taarifa kwa umakini. Rather than relying on ad hominem why don't you bring out what you have and we can see if it holds water. Unless of course you do not have facts to disprove the article, in which case silence would be the best option. There is a saying i love "A fool in silence seems wise, yet he will open his mouth and remove all doubt of his foolishness". I am not saying you are a fool, be it far from me to ever think that of you. I am saying your reliance on insults as arguments makes me wonder if indeed you are one. I dont have time for this! Stop being lazy and do a little research, for starters go through this thread and be informed, this is not K talk where you will find busybodies who have ample time to gossip. Sgr tanzania ilikuwa inajengwa kukimbizana na ya Kenya ila itaangukia pua. Okay, from the comments i notice tanzanians have some animosity towards Kenyans, if your hard on for kenya lasts more than five minutes, you need to see a doctor.First they rely on insults instead of concrete arguments, by the way the guy i quoted is an economist and i would rather take advice from an economist than reading propaganda articles from the tanzanian government. Also the constant comparison between kenya and tanzania is nonsensical. It is akin to comparing a rolls royce to a bullock cart. No one has even tried to dispute the facts stated in the article, what they have done is to insult every person who offers a counter argument without offering any fact that counters the article. Also comparing a project that is by all intents and purpose still a hypothetical with a working project is illogical in the least. And on Wednesday, Tanzania, through its state-run railway firm Reli Assets Holding Company (Rahco) put out a tender for the supply of electric locomotives, 14 of which will carry cargo. Tanzania has set aside funds for the purchase of the engines and carriages. “It is intended that part of the proceeds of the funds would be used to cover eligible payment under the contract for supply, testing, commissioning and training of rolling stock for the SGR railway system to operate in the Tanzania central railway corridor,” reads part of the advertisement announcing the tender. Dar is seeking the supply, testing and commissioning of the electric locomotives for freight trains and five electric multiple units. The railway firm is also looking for the supply of three electric locomotives for departmental trains, 15 first-class coaches and 45 economy-class coaches. To supplement the electric locomotives, Tanzania is also looking at receiving two diesel locomotives for freight trains, 600 flat wagons, 500 box wagons, 200 oil tankers, 50 bulk wagons, 70 gondola wagons, 50 ballast hoppers and 50 double stack container wagons.